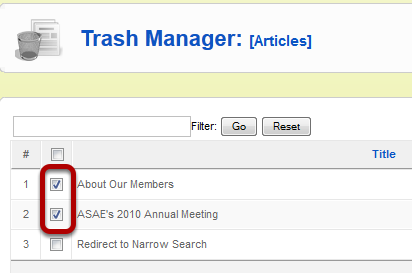 Any article that has been deleted through the Article Manager can be restored to its original state**. This will show you the steps involved in restoring 1 or more articles that have been deleted. **Please note: articles will be restored in an "unpublished" state and will need to be changed to "published" state in order to be viewable on your site. Confirm the action by clicking "Restore" and then "OK"